Hilltop pastures, live oak and chestnut woods, springtime-green fields of wheat lined the twisting roads our motorcycle followed into the region of Le Marche on that spring day a few years ago. Le Marche is the only one of the twenty regions of Italy with a plural name and although the name of this region became official only in 1815, the name is certainly of ancient Germanic origin, deriving from “mark” meaning “territory” or “region”. This term was used to define the border territories of the empire of Charlemagne which were generally governed by a marchese (“marquis) or “lord of the mark”. At the end of the tenth century, numerous “mark” (or marche, as the Italians called them) were defined between the Appenines and the Adriatic Sea and were gradually consolidated until the plural form, le marche, appeared in early 19th century literature to denote the area. Bordering Umbria on the east and extending to the Adriatic Sea, Le Marche region became part of the Papal states in the 16th century, closing centuries of strife between Papal authority and imperial authority. A network of Romanesque churches and monasteries as well as fortified feudal fortresses threads its way through the region, a testament to the age-old attrition between religious and civic power poles. 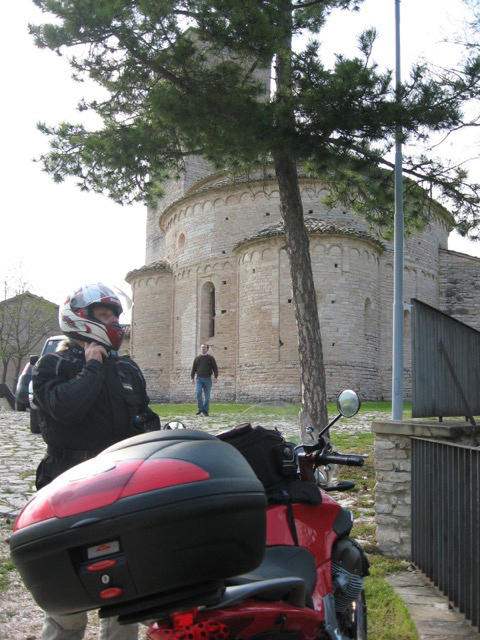 Most fitting, therefore, that our first stop was at an ancient church of the eleventh century, San Giusto, not easy to find, at the top of a winding road. Perched on a hill with wide expansive views all around, the position of the church was telltale in defining its past history: a defensive position during the violent period of the Middle Ages. Almost always, what is a sacred site today was a sacred site for the Romans and this site would have been perfect for the sacrificial offerings of both the Romans and the Piceni, native people of Le Marche, who worshipped here even before the Romans. Our arrival at San Giusto. Like many of the earliest Christian churches, San Giusto was built in-the-round, following the models of pre-existing temples (such as the Roman Pantheon). The circular form symbolized the firmament, the “cupola” of the heavens. The perfectly-rounded stone hemisphere of San Giusto in local limestone truly astounded. A volunteer custodian from the nearest village, trusted keeper of the church keys, had opened the church in preparation for a wedding the next day. Our good fortune. 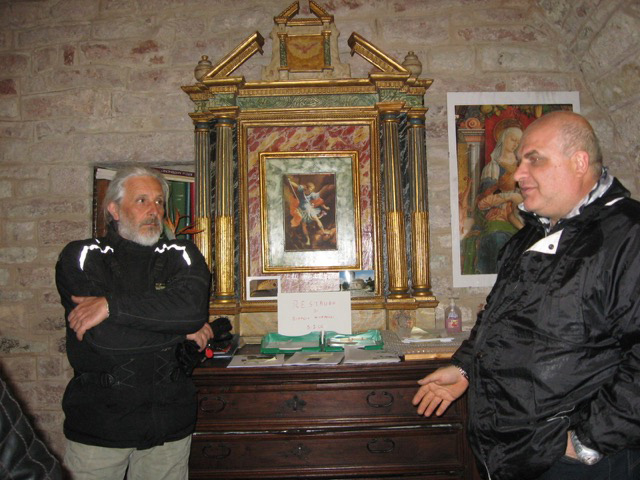 He enthusiastically gave us a tour of the church and showed us with pride the 17th sacred image to the Virgin and Child tucked away in the sacristy. He pointed to a tall wooden ladder leading up to the belltower and asked us if we wished to climb up. 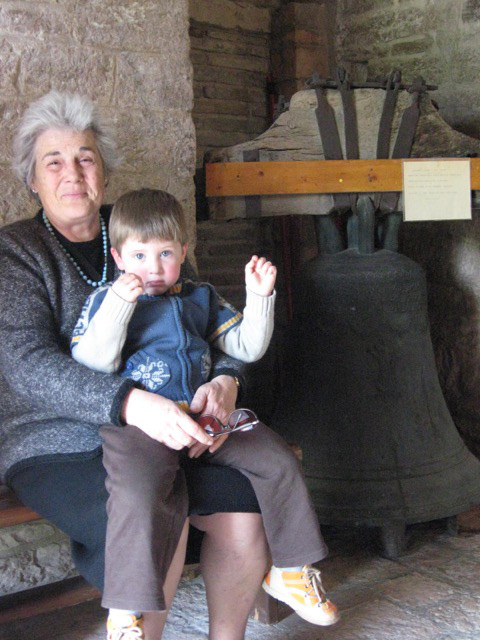 We refrained as had the elderly Signora Norma and her little grandson Davide who sat near the enormous bronze church bell, no longer tolling up in the tower but now placed like a sentinel near the church entrance. We mounted the motorcycle and followed the dirt road snaking downwards and towards Tolentino, our next stop.